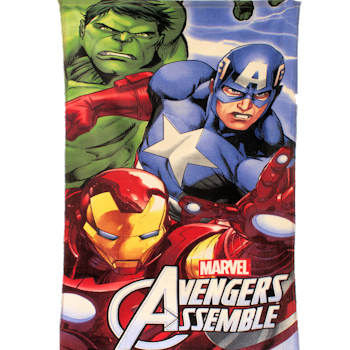 Marvel Avengers Assemble beach towel that can be personalised with an embroidered name if you choose. Marvel Avengers Assemble beach towel that can be personalised with an embroidered name if you choose. Made from 100% lightweight Cotton, 120 by 60cm approx. Image may differ from that pictured A super cool Avengers towel that is handy for beach holidays, sports or swim lessons! Amys Gifts can personalised this gift for a small additional charge. Initials or a name of your choice embroidered on the beach towel.